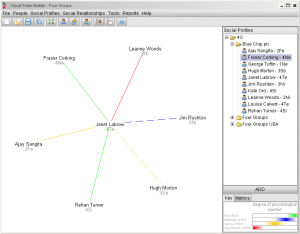 The Visual Team Builder (VTB) software is one of the key components of 4G and allows users to visualise and quickly access information relating to individuals, relationships and teams. The VTB also enables users to quickly generate 4G reports and utilise a number of other 4G features. There are a number of features in the Visual Team Builder that add significantly to the value of 4G. In particular the VTB enables users to gain an accelerated understanding or insight into any particular team. It also makes 4G a much more scalable instrument, offering the ability to quickly model or understand specific relationship and team dynamics across an entire organisation.